The S102 (uOLT) is a small scale E-PON OLT for connection between Ethernet and E-PON networks. In the present time, new service requires not only old function but also new function on xDSL/Cable Modem. Today, the FTTH technology becomes popular through E-PON, and the E-PON network made a low cost solution for FTTH service. The E-PON can be deployed more safely and efficiently with SLA (Service Level Agreement), blocking subscriber, bandwidth guarantee for delay sensitive service, and efficient Multicast control on IP TV service through fiber communication from CO (Central Office) to whole subscribers. 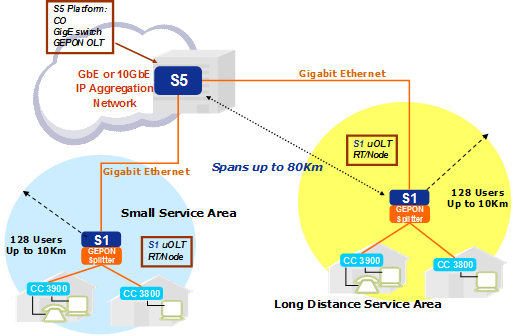 S102 (uOLT) provides efficient FTTH solution such as QoS, multicasting, VLAN, bandwidth limitation, standardized management, easy S/W upgrade, and optimized subscriber with network management.